Hindu and Buddhist Pilgrimage sites Tour in Nepal with Pink Mountain Treks and Expedition bring you to tour in major Hindu and Buddhist Pilgrimage Sites of Nepal.Nepal is the Hindu majority country. The second largest religion is Buddhism. Hinduism is a multi disciplinary religion called Shanatan Dharma. The Hindu religion has a large number of Gods but the Trinity of Gods is considered Supreme. The Trinity of Gods are: Brahma: The Creator; Vishnu: The Preserver or Savior; and Shiva: The Destroyer. The Gods are always associated with their consorts. The Gods are not considered complete without their counterpart i.e. consorts. The three gods represent the three fundamental powers of nature which are manifest in the world viz. creation, destruction and maintenance. The Creation is going on all the time and so is the destruction. And preservation is an integral part of the processes of creation and destruction. Brahma: The Creator is not worshiped as such and no known temples or Pilgrimage is associated with Brahma except for his consort Sarswoti. Sarswoti is Goddess of Learning. Vishnu: The Preserver or Savior. Occasionally, the balance of power is upset in favor of evil, and then Lord Vishnu is believed to descend to earth in a mortal form to save humankind or the world. The phenomenon is called Avatar (Re-incarnation). Ten such incarnations are commonly recognized, of which Lord Rama and Lord Krishna are the most important. Nine such incarnations are have already occurred; the tenth and the last Kalki is yet to come. Shiva: The Destroyer : Consort Parbati: Ma Parbati incarnated as a Shakti (power) to destroy the Demons (evil power). Kali, Chandi, Durga are most famous incarnations. Lord Shiva and Consort are very popular God and Goddess. Lingam is symbol of Shiva and is worshiped. Lord Shiva appears as Bhairab when he is in his fearful or terrific form. There are three kinds of Hindu Pilgrimages in Nepal for 1. Lord Shiva 2. Lord Vishnu, and 3. Ma Shakti. According to Purans Himalaya is home of Lord Shiva and Parbati. Hence there are many Pilgrimage sites related to Lord Shiva in Nepal. Pashupati Nath Temple is the Holiest pilgrimage of Lord Shiva. Mt. Kailash is the mountain of Lord Shiva and it is considered holiest of all holy mountains. Mt. Kailash is in Tibet near Nepal Tibet border. A mountain with a Temple on its top is also considered Holy Mountain. There are several Shakti-peeths related to Durga Ma through out Nepal. Dakhinkali and Guheswori are most famous Shakti-peeths of Kathmandu valley. Other important Shakti-peeths are Pathibhara, Shaileswori, Vindyavashini, Mankamana, Jogeshwori, etc. Such Shakti-peeths are usually situated on the top of a mountain. The confluence of rivers, particularly when they are major tributaries of the Ganges, is always regarded as religiously significant by Hindus, as it is believed a third spiritual river also joins. Such confluence is called Triveni. Lord Shiva is worshipped as Pashupati, which means Lord of all living creatures. The temple of Pashupatinath is 6 Km east of Kathmandu. Pasupat-Chhetra (site of Pashupatinath) is one of the holiest places in Hindu Kingdom of Nepal. Many Hindu Pilgrims come Pashupatinath round the year. Hundreds of thousands of Hindu from all over World make Pilgrimage on the day of Shivaratri (Night of Shiva, one day before black moon in February). There are many temples of various Hindu Gods in the holy site. Guheswori temple is the most important among other temples. A walk from this temple to Aryaghat near Pashupatinath temple is very popular among non-Hindu tourists. Pashupatinath Temple area is UNESCO World Heritage site. The Shaligrams are specifically described as fossil-stones which have taken shape in the Gandaki-river, and as characterized by the presence of discus marks . 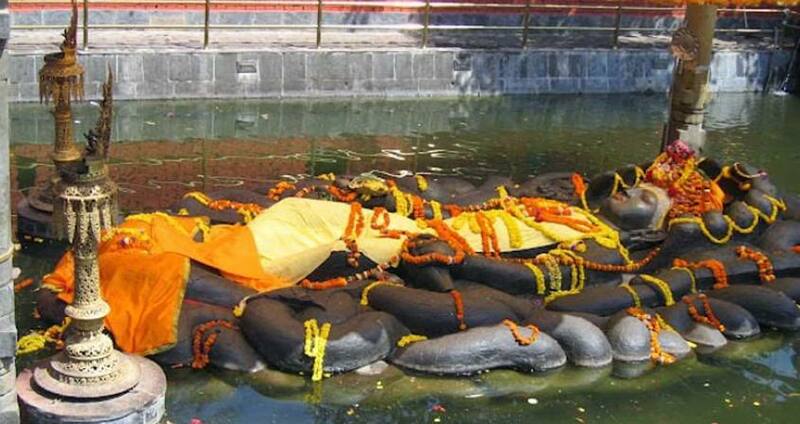 The legend, related at length tells us that Gandaki, the lady-devotee, performed penances for long years, and that she got a boon from Vishnu, which made Vishnu reside in her womb (in her depths) as her own offspring; the Shaligram-stones are thus the forms of Vishnu. Like the worship of Siva in the form of a lingam, the worship of Vishnu in the shape of a Shaligram is an iconic in character. Shaligrams are always naturally found in the river Gandaki. The region where Shaligrams are found is also called Shalgrams. The Shaligrams region is in Mustang and River Gandaki basin. These also include the famous Kali-Gandaki river, Muktinath, Damodar Himal, Damodar Kunda, Devghat, etc. Damodarkund is a glacier lake at the slope of Damodar Himal in Mustang. The Damodar lakes are located three days walk north east of the main Mustang trekking route and very close to the border with Tibet. Damodar Kunda is the source of River Kaligandaki. The site is in the region of Shaligram and hence it is also called Shalgrams. Other names of River Gandaki are Kaligandaki, Sptagandaki, and Narayani. 50 km from Tansen at the confluence of the Kali Gandaki and Ridi Khola. In this small place, here is a temple of Rishikeshwara (Vishnu) with 50 other small temples. Pilgrims visit here to earn merit for this life as well as for their next life. About 200 Vishshnavas of the Nimbarka & Sri Ramanuja Sampradaya sects live in near by Ridi Bazar. This is one of the 106th sacred Muktichhetra (assured of salvation) of 108 sacred place of Vaishnavs, where Lord Vishnu got free from the curse of Sati. Here is a largest Shaligram. Here is also a Jwaladevi, a divine flame is continuously burning since thousands of year. This pagoda –shaped temple dedicated to Lord Vishnu situated at an altitude of 3800 m. Set into the wall around 108 water spouts from which pour holy water. Janakpur is in 375 Km south east of Kathmandu and is famous Hindu pilgrimage site. Janakpur is a birthplace of Janaki Sita. Janaki Sita was married to Lord Ram the 7th incarnation of Lord Vishnu. Places of interest are: Janaki Temple, Biwah Mandap, and numerous beautiful ponds. The most auspicious day for the Pilgrimage is Biwah Panchami (November). It is day of celebration of the wedding of the Goddess Sita and the God Ram with mock wedding processions. Many pilgrims from Nepal and India attend the celebration. A holy saint Sri Shurkiswor Das discover the ruins of the ancient capital Mithila King and the birth place of Sita. The present temple was built by Queen Brishabhanu of Tikramgarh of India. It is an island in Narayani River near Triveni, 20 km south of Kusunde, which lies between Narayanghat and Butawal in Mahendra Highway. Goddess Sita was exiled from the royal palace and stayed here. She gave born twin sons Lava and Kusha. This Ashram was a retreat used by the great sage Balmiki, who wrote complete epic of Ramayan. Khaptad Sage was staying there for enlightenment and became very famous Sgae all over the Hindu fellow.He stay there at burning firehood and became very famous Siddha. Shiddartha Gautam led the world on the path to enlightenment and became Lord Buddha two thousand five hundred years ago. There are four most holy places associated with the Lord Buddha and are Buddhist pilgrimage. Lumbini (Nepal): Where Buddha was born as the Prince Shiddhartha Gautam. The site is in now in a beautiful Garden. Lumbini is about 20 minute drive from Siddarth Nagar, a town in mid western Nepal. Ashok Pillar, Maya Devi Temple, Archeological excavation sites, various Buddhist temples and monasteries from Buddhist countries from all over worlds are in the Lumbini Garden. Bodhgaya: Where Buddha enlightened under a Holy Banyan tree. Sarnath : Sarnath where Siddhartha Gautama who came to be known as the Buddha, the 'Awakened One', delivered his first sermon, after attaining enlightenment. Kusinagar: is revered as the site of the Buddha's Mahaparinirvana, his death and cremation, that marked his final liberation from the cycles of death and rebirth. Namobuddha is the place where Lord Buddha, in an earlier life, offered his body to a starving tigress so she could feed her cubs. It is said that his hair, bones and so forth were made into a Stupa, the Stupa now known as Namobuddha. It is in east of Kathmandu valley near Panauti. Important Buddhist Stupa in Kathmandu valley are Swoyambhunath, Bouddhanath, four Stupa built by Ashok Emperor in Patan and one Chabhil, etc. There are several Tibetan monasteries around Kathmandu valley. Some of the monasteries are recently built. Thengboche Monastery is the highest altitude monastery in Nepal. Day 01:Arrival in Kathmandu In ternational airport and meet with representative from Pink Mountain Treks and Expedition then transfer to Hotel. Refreshment drink. Hotel Check-In. Trip outline and tour briefing. Day 02:Tour to Pashupatinath, Changu Narayan, Budhanilkantha, Tulaji Bhagvati, Jor Narayan, Kumari Ghar, Naradevi, Shova Bhagwati, Sankata, Swayambhunath Stupa, boudhanath Stupa, Kirtipur Mahabihar. Day 05:Fly to Biratnagar.Tour to Chataraghat, Baraha, Kichak Badh, Bijayapur. Day 09:Visit to Bariyarpur, Ghadirwaha, Simraugadh, Balmiki Ashram. Day 11:Visit to Devghat, Maulakalika. Day 12:Tour to Ramagram, Devadaha, Lumbini, Niglihawa, Gotihawa, Sagarhawa, Tilaurakot,Twins Stupa and More. Day 14:Tour to Ratannath Temple, Kanchana. Day 16:Tour to Khaptad,Chandannath, Thakurji. Day 19:Tour to Ridi,Ghising,Argha, Baglung Kalika. Day 21:Tour to Muktinath, Krishna Gandaki for Shaligram. Day 24:Tour to Worlds Peace Pagoda, Taal Barahi, Gupteshwor Cave, Bindhyabasini, Dhor Barahi,. Day 26:Tour to Gorkha Kalika, Manakamana Temple. Day 28:Trip to Gosainkunda, Nuwakot Kalika. Day 32:Fly back to your Destination. Day 1Arrival in Kathmandu In ternational airport and meet with representative from Pink Mountain Treks and Expedition then transfer to Hotel. Refreshment drink. Hotel Check-In. Trip outline and tour briefing. Day 2Tour to Pashupatinath, Changu Narayan, Budhanilkantha, Tulaji Bhagvati, Jor Narayan, Kumari Ghar, Naradevi, Shova Bhagwati, Sankata, Swayambhunath Stupa, boudhanath Stupa, Kirtipur Mahabihar. Day 5Fly to Biratnagar.Tour to Chataraghat, Baraha, Kichak Badh, Bijayapur. Day 9Visit to Bariyarpur, Ghadirwaha, Simraugadh, Balmiki Ashram. Day 11Visit to Devghat, Maulakalika. Day 12Tour to Ramagram, Devadaha, Lumbini, Niglihawa, Gotihawa, Sagarhawa, Tilaurakot,Twins Stupa and More. Day 14Tour to Ratannath Temple, Kanchana. Day 16Tour to Khaptad,Chandannath, Thakurji. Day 19Tour to Ridi,Ghising,Argha, Baglung Kalika. Day 21Tour to Muktinath, Krishna Gandaki for Shaligram. Day 24Tour to Worlds Peace Pagoda, Taal Barahi, Gupteshwor Cave, Bindhyabasini, Dhor Barahi,. Day 26Tour to Gorkha Kalika, Manakamana Temple. Day 28Trip to Gosainkunda, Nuwakot Kalika. Day 32Fly back to your Destination.